Hello to you out there! How have you been doing with your plant-based whole foods lifestyle? Me? Oh, my. I have been doing great! But with anything this amazing and life changing, comes a desire and curiosity to continue improving until you've reached your fullest potential. That is where I am today, and I seem to be lost in thought, very deep thoughts, about the funniest thing I have ever pondered in such a way. Salad! Dr. Fuhrman tells us "The salad is the main dish!" and he is absolutely right. Big changes awaited me after I became focused on mastering this little challenge as a Nutritarian. I crave my salad each day, as funny and backwards as that sounds, and have developed many different nutritarian dressings to use with them. My Husband though, bless his culinary emblazoned soul, came up with the mother of all Nutritarian Dressings, and absolutely changed the way I ate salad. I had to have that dressing every day or else I would feel something was missing; it caused me to eat a LOT more salad than I had been eating! Which was good until I actually noticed how much dressing I was consuming with salad being the staple in my diet! I know the dressing was nutritarian, but still, something in me was grossed out by it! The thought of consuming a whole tupperware of dressing every 1-2 weeks due to the massive amounts of greens I eat was really disturbing me until last night. I decided since I was running out at the end of the day, that I would attempt to eat my salad dry. Fancy that?! Now I am taking this to a new level. I shouldn't be surprised, I don't do anything half way! So, right now, I am having my huge salad for lunch and have noticed a few very interesting things! I have spent the last 2 years honing in on my ability to taste the subtleties of natural whole foods like fruits and veggies without sugar, butter, oil or salt, but have absolutely denied myself the same opportunity with the salad leaves! Would our ancestors, scavenging around for the day, eating the greens they found along their journey, have had the time to get their vitamix and puree up nuts, seeds, dates and other things mixed together to make their salad palatable before eating it? There was my answer. 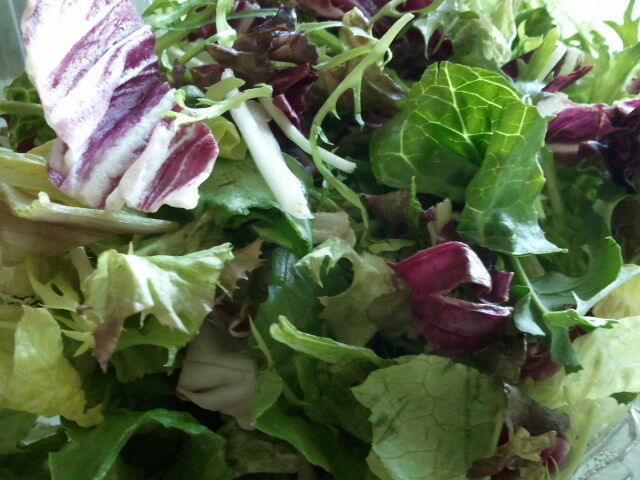 Greens should be edible by themselves! We just don't give them a chance! Perhaps to be like this from day one of trying to change your life would be asking too much, but seriously. Why have we neglected the greens? Why do we not attempt to appreciate them for what they are like we do with the other veggies?